Sasha Farber is back as a pro dancer for the sixth time on Dancing With the Stars. 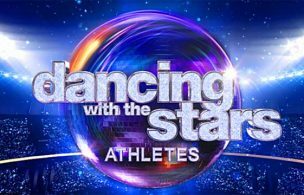 After going to the finals in Dancing With the Stars: Athletes last season with Olympic ice skater Tonya Harding, he’s been paired again with another Olympian –gymnast Mary Lou Retton. Retton skyrocketed to fame after winning the Gold Medal for her performance in the individual all-around competition at the 1984 Olympics. She was the first female athlete to appear on a box of Wheaties. On Monday, the pair danced a Waltz to "(You Make Me Feel Like) A Natural Woman," earning 22 points. On Tuesday, the pair danced a Samba to ‘Copacabana,’ earning 24 points! The couple wasn’t placed in jeopardy, but Farber’s wife, Emma Slater, and her celeb partner John Schneider (Dukes of Hazzard) were. In this exclusive blog, Farber shares his thoughts as he and Retton continue their quest to winning that coveted mirror ball trophy! I’m not sure why we had two shows the first two weeks, but it felt like a finale week, having to learn four dances. Props to the pros, celebrities and the creative teams for hanging in there. This is usually something couples have to go through in the second half of the competition after they have dances under their belts. To do it this way was hard. They’re all amazing. We had Sarah Bockel singing "A Natural Woman" on Monday. She’s been on Broadway in Beautiful [the Carole King story]. It’s a bonus when artists come on the show and sing while we dance. You want to bring someone on who fits the themes and, this week, we had New York night and Las Vegas night. We were lucky enough to have such great singers on. It added another dimension to the dance. It felt like we were dancing on Broadway. Mary Lou had an incredible time and it helped the feeling of the performance by having a singer sing live for us. Len [Goodman, judge] gave us nice feedback. All the judges are there for a reason. They’ve seen it and done it all. You want to please them in a way. You want to hear their critique and you take what they say and go and work on it and come back and you bring the finished product. I’ve been a fan of Len’s for a long time. He’s a very sweet man and an amazing judge as are Carrie Ann [Inaba] and Bruno [Tonioli]. Positive feedback from them gives us more confidence. That’s what Mary Lou has been struggling with – her confidence. She wants to show her true colors. Being America’s sweetheart at 16 isn’t easy. You can lose your life because you’re not a normal kid anymore. You don’t go out and play with kids. You don’t go to school. Kicking off his exclusive blog, the pro partner of Mary Lou Retton shares his thoughts on the first week. Mary Lou and I were not in jeopardy last night, but Emma and John were. It is absolutely horrible seeing that. It’s the worst. When Emma’s in jeopardy, I feel like I’m in jeopardy. It’s horrible. I can’t explain how horrible it is. She and I talk every day about the show and how it’s going. We support each other. The whole show is a family. Mary Lou talked about the injuries and surgeries she’s had over the years in the video packages this week. She’s not complaining, but there are things she has to inform me about. I’m learning more and more about her injuries. She’s literally an ‘Iron Woman’ – she’s being held up by screws. We’re going to learn next week how doctors told Mary Lou that she couldn’t do the Olympics, but she went for it, and now she’s paying the consequences. Season 27 sent a second contestant packing this week. I want Mary Lou to enjoy her experience, which will be easier now that we’re going to one dance a week. It’s still going to be pretty hard. Next week, we’re doing a beautiful Viennese Waltz, which will be dedicated to her most memorable year, 1984, when she won at the Olympics.